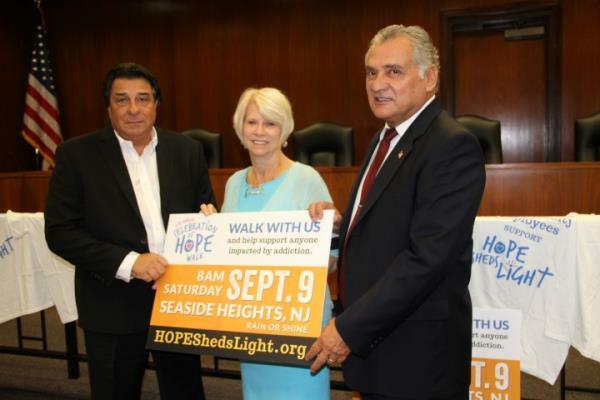 Ocean County Freeholder Director Joseph H. Vicari and Freeholder Virginia E. Haines joined with Ron Rosetto, a founder of HOPE Sheds Light and representatives from Ocean County Government departments in kicking off the county walk team for the upcoming HOPE Sheds Light Walk scheduled for Sept. 9 on the Seaside Heights Boardwalk. The mission of HOPE Sheds Light, Inc. is to raise awareness and educate individuals, families and the community about the disease of addiction and to provide hope and resources towards recovery. The Ocean County Employee team raised almost $2,500 for the organization in 2016.